Google most valuable brand; Microsoft at No. 2. 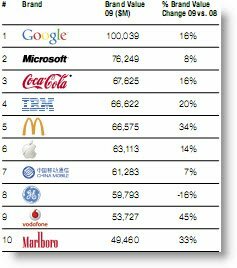 BrandZ has released its Top 100 Most Valuable Global Brands ranking. The BrandZ top 100 ranking is an authoritative ranking report about the most valuable brands in the world. The Google Brand has been valued at $100B followsed by the Microsoft Brand at No. 2 at $76B. The valuations are based on economic and market data and the proprietary consumer research from BrandZ. The brand value published is based on the intrinsic value of the brand — derived from its ability to generate demand. The dollar value of each brand in the ranking is the sum of all future earnings that brand is forecast to generate, discounted to a present day value. Given the high volatility of inancial markets over the past 12 months, the brand value is in some cases high relative to current market capitalization, relecting true value rather than current market swings.